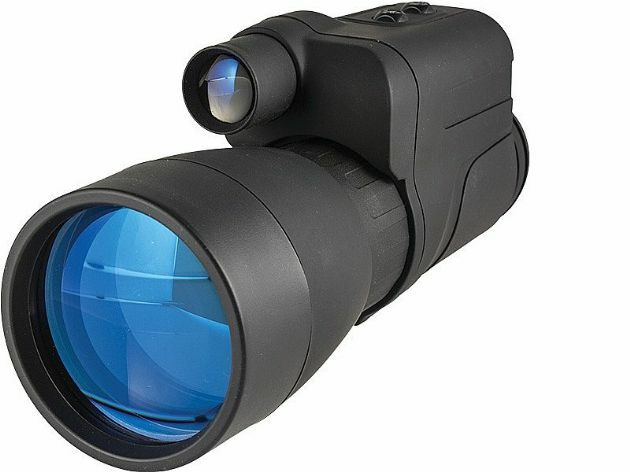 The Yukon NV 5x60 offers the highest magnification from any budget monocular unit in the current Yukon range. With focusable objective and ocular lenses for greater control, it is the large multi-coated 60mm objective lens, which maximises light transmission to the premium Gen 1 image intensifier tube. The functional sure-grip ABS plastic body-shell is suitable for left or right handed use while the raised latching switches come easily to hand and give a positive response when pressed. Twin operational status LED’s illuminate green and red to indicate the active functions and alert the user should the device be accidentally turned or left switched on. The built-in IR illuminator will enhance the performance and allow use in low-light and total darkness and a ¼” Whitworth thread is built-in to the base of the unit to accept tripods and optional accessories. The NV 5x60 uses a 3v Lithium CR123A battery (not included) that can power the unit for up to 72 hours (without IR) and gives the unit good cold weather performance. Each unit is individually serial numbered and comes supplied with a secure detachable wrist strap and a soft carry case.